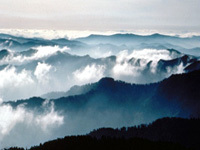 East of Nashville on the border between Tennessee and North Carolina lies the Great Smoky Mountains National Park. Covering more than one and a half million acres, the park is the largest in the eastern United States, and America's most visited park. The park is a designated International Biosphere Reserve and a World Heritage Site, drawing millions of visitors every year to enjoy the panoramic views, tumbling mountain streams, uninterrupted forest, and historic buildings it encompasses. The main route to the park is via Knoxville, Pigeon Forge, and Gatlinburg, all worth a visit in their own right. Inside the park itself there are more than 270 miles (435km) of road through the ancient mountains, which are home to a variety of plant and animal life, many of the species unique to the area. The American Black Bear is the symbol of the Smokies and the park's most famous resident, while some more rare residents have been reintroduced into the area since the park's inception include the river otter, elk, and the Peregrine Falcon. The park offers numerous outdoor recreational pursuits and offers a glimpse into the lives of early southern Appalachian farming families, with 77 historic structures like log cabins, barns, churches, and gristmills. There is also a research library open by appointment that contains documents relating to the area's history. Opening times: Primary roads are open 24 hours a day all year round.